Over the years, we’ve learned that buying homes near certain types of businesses can boost the value quite substantially. For example, homes near Starbucks tend to outperform those near a Dunkin’ Donuts, and you’re better off buying a condo next to a Target, not a Walmart. If there’s a Whole Foods or Trader Joe’s nearby, even better. Throw in a good school and you’ve hit the housing jackpot. Plenty of homeowners purchase properties with kids in mind, particularly because of the nearby schools. After all, private school isn’t getting any cheaper. But aside from saving a ton of money on tuition costs, you can also gain a ton of home equity simply by choosing to purchase a property in a good school district. The new parent company of RealtyTrac, ATTOM Data Solutions, decided to analyze this phenomenon and discovered it’s pretty darn significant. They looked at 2015 average test scores from nearly 19,000 elementary schools nationwide across 4,435 zip codes that cover a combined 45.9 million single family homes and condos. From that they found that of the 1,661 zip codes with at least one good school, the average estimated home value (as of July) was $427,402, a 77% premium compared to the $241,096 average in the 2,774 zip codes without any good schools. So you might be thinking wait, homes near good schools are a lot more expensive. While that might be true, the home price appreciation in good school districts wallops the performance of inferior school districts. In areas with a good school, home prices have increased an average of $74,716 since the time of purchase, compared to just $23,311 in zip codes without any decent schools. On a percentage basis it’s a bit closer, a 32% gain versus 27.5%, but still noticeably higher. 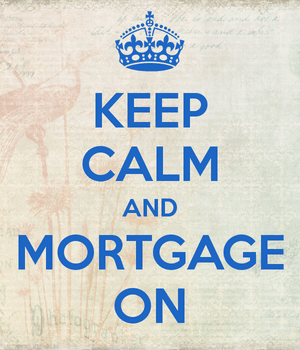 On a dollar amount basis, we’re talking another $51,000 in your pocket. That’ll come in handy for college. Overall, the return on investment (ROI) was better in zip codes with at least one good school versus those without good schools in 114 of 173 metro areas. There were some outliers, of course. The more notable areas include zips without good schools in Los Angeles, Riverside-San Bernardino, Sacramento, Orlando, and Washington, D.C. I suppose sometimes a stellar location is enough to drive value, even if the schools are no good. The company also discovered that home prices are more volatile in zip codes without good schools. During the recent downturn, between 2006 and 2011, median home prices fell 28.9% in areas without good schools. Meanwhile, the drop was only 23% in areas with at least one good school, so they held up better. At the same time, home price appreciation in zips without good schools outpaced the better school zones over past five years during the real estate recovery (up 47.9% vs. 42.2%). ATTOM Data Solutions senior vice president Daren Blomquist noted that this volatility could potentially benefit homeowners over the short term, but most likely won’t over a span of 10 years or more. You should still be okay over the long term though…seeing how forgiving real estate is. However, homes in poor school districts have yet to fully recover; year-to-date, median home prices in the bad school districts are still 1% below levels seen in 2006, while homes in good school districts are up 4.5% from previous peaks. It appears it’s no secret when a certain area has a good school nearby, but there are still some bargains out there if you look hard enough. 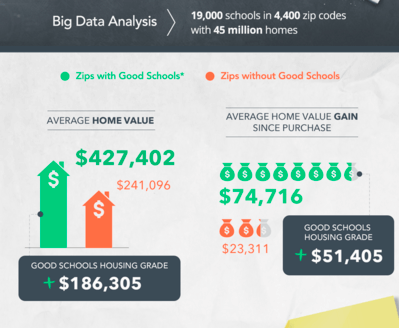 ATTOM compiled a list of 117 zip codes as “Good School Bargains” where one can purchase a property for $150,000 or less (based on median) and still take advantage of at least one good school in the area. Additionally, both school scores and home prices have improved in all of these areas from one year ago and from fives years ago. So things are only looking up. Here are the top ten, with the highest rank indicating the least home price appreciation over the past 10 years, meaning it still might have quite a bit of upside. Some quick and easy tips to find a home with great potential. Is it within a quarter mile of a Starbucks? Close to a Target but not a Walmart? Near a Whole Foods or Trader Joe’s? Still on sale relative to recent prices?